Celebrate World Psoriasis Day 2014, Help Educate and Raise Awareness For the past 10 years the psoriasis community has come together to celebrate World Psoriasis Day, an opportunity to not only raise awareness but also educate the public on psoriasis and psoriatic arthritis. This year, that day is today. Wednesday October 29th is World Psoriasis Day. 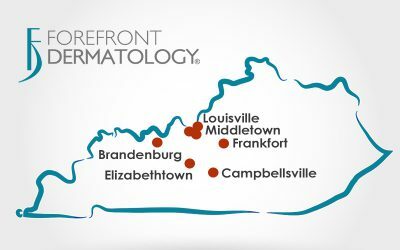 We invite you to join the team at Forefront Dermatology in spreading the word and educating the public. There are many misconceptions that make life difficult for those living with psoriasis. Increased public awareness and a better understanding of the disease can help psoriasis patients lead more confident and happy lives. Common Misconceptions Regarding Psoriasis MYTH: Psoriasis is Caused by Bad Hygiene FACT: Skin lesions commonly associated with psoriasis often lead people to assume poor hygiene has caused the problem. The truth is, psoriasis is an autoimmune disease that is in no way related to personal hygiene. Patients with psoriasis often have a genetic predisposition to developing the disease. Hormonal changes, stress and even some medications can trigger flare-ups of the patient’s psoriasis. It’s common for patients to experience psoriasis cycles: periods of skin lesions followed by periods of clear skin. None of these psoriasis triggers are related to poor personal hygiene. MYTH: Psoriasis is Spreadable FACT: Psoriasis is an autoimmune disease resulting from a defect in the patient’s immune system. The immune system, which normally defends the body against disease and outside hazards, malfunctions and sees the patient’s own healthy cells as foreign. As a result, the patient’s immune system attacks its own body, causing skin lesions. Psoriasis is not contagious; it does not spread from person to person; and you cannot catch it, nor can a patient with psoriasis give it to someone else. The skin lesions associated with psoriasis are often red, thick, dry and scaly and at times may crack open and bleed. People not educated about the disease often think the lesion is infected and contagious, and that it can be spread to other people. This is not true; psoriasis is neither contagious nor spreadable. It’s important to educate the public about the cause of psoriasis so they understand that it isn’t contagious and it won’t spread to other people. The goal is to help the public understand that they can safely interact with psoriasis patients. MYTH: Psoriasis is Simply a Cosmetic Condition FACT: Psoriasis is not a cosmetic or superficial skin condition. Psoriasis is a chronic, autoimmune disease that a patient must manage for the rest of their life. The skin lesions may appear to be a cosmetic problem, but it’s important to understand that psoriasis can cause intense itching and discomfort as well as causing embarrassment for the patient. The development of psoriatic arthritis occurs in 10-30% of psoriasis patients. This is an inflammatory arthritis that can cause joint stiffness, swelling and chronic pain. Long-term joint damage is often seen due to the inflammation, resulting in joint issues that go beyond cosmetic appearance and can be debilitating and crippling. World Psoriasis Day provides an opportunity to educate the public by addressing common misconceptions. 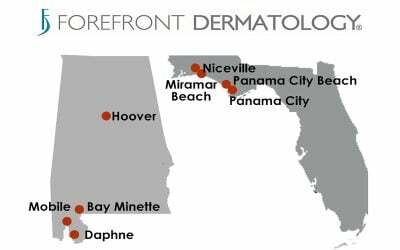 If you or a family member has psoriasis, we encourage you to contact the team at Forefront Dermatology. 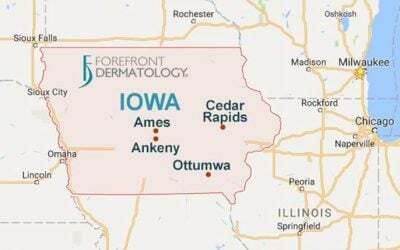 The dermatologists in Cedar Rapids, Iowa can help with diagnosis, treatment options and long-term disease management. 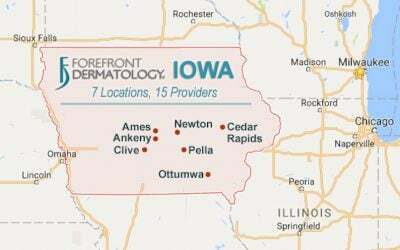 Call 855-535-7175 for an appointment. 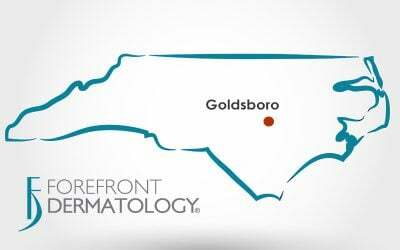 Click here to request an appointment online or find a dermatologist near you to schedule an appointment.